Within minutes of finding my new desk, my inbox is flooded with emails. ‘Here’s your password’, ‘Induction meeting with Angela’, ‘Biofuel protest Wednesday’ etc. I smile; my main worry was having nothing to do and it certainly looks like they’ve thought of some things to keep me busy for my first couple of days at least. Then I frown. 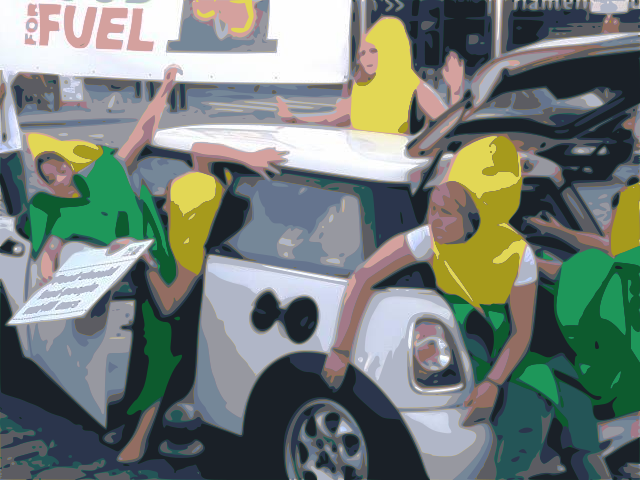 Biofuel protest? I click on it and read that Oxfam – the organisation who has led the charge for climate change refugees – is against biofuels. Maybe it’s the name or perhaps the media coverage these ‘sustainable’ miracle-crops received when they were first seen to be the answer for tackling car emissions, but I had always assumed (and please excuse my ignorance any climate change veterans out there) that they are a Good Thing. A quick read of the Oxfam report The Hunger Grains quickly corrects my misdemeanour. Not only do can ‘first-generation’ biofuels be accused of distracting a vital source of food from the world’s hungriest and causing human rights violations via ‘land-grabs’, but they are also actually bad for the planet. My education couldn’t be more perfectly timed: September 11th would mark an important vote in the European Parliament and the target of months of lobbying from Oxfam. It is a little intimidating, of course, coming into an office with its war-face on. I have no experience – and clearly little knowledge – of this kind of environment. After a hour-long induction with the Media and Communications Officer, I’m excited but I feel that I won’t be too much of a help in a vote which, seemingly, is all to play for. My first week and a half (the run up to the vote) is admittedly, a tad boring. My responsibilities are limited and everything is gently scrutinised by my boss. I am put in charge of media monitoring, highlighting important coverage of both sides campaigning. I tweet several times a day, carefully watching which #hashtags are trending. Hardly exhilarating work, I admit. I am one of the lucky development interns though. Everyone seems to suggest that the first few weeks are tough, especially for a newbie whose only education of the subject comes are the few odd essays on ‘structural adjustment’ and Amartya Sen who finds themselves in some faraway corner of the developing world. I, however, am in Brussels, living with a handful of close friends in a country remarkably similar to my own (bar the on-going Flemish/French turf-war). Try the chips and mussels, they’re pretty good. The day before the vote, however, my boss asks me to put together the press releases for the vote. Four different reactions for the four different scenarios the office’s ‘biofuel expert’ envisages. Having been a bit mopey for the past week about ‘not enough responsibility’, it all becomes very daunting. I research previous examples, penning several different options for each situation just in case she doesn’t like my favourite. Eventually I email them to her and, after a light bit of editing, she forwards them on to the head of Oxfam EU who, in effect, the quotes will be referenced to. We don’t win the vote, but we don’t lose it either. Proposals don’t simply get accepted or rejected, but rather the ‘bill’ is scrutinised to the point of every amendment decided in committee. Biofuels are capped at 6% and ILUC will be acknowledged from 2020. The next day I am doing my usual ‘media monitoring’, searching for articles which affect the myriad of issues Oxfam covers. And there it is, near the bottom of a Guardian article. My very first press release credited to a man far more respectable than a lowly intern. My boss says “you must be very proud”. I try to brush it off, but I am a bit. “Well,” she says, “Oxfam is releasing the austerity report tomorrow, and we expect a lot more press coverage than we got for biofuels”. She sends me a wad of papers to proof read with the instructions to make any changes I see fit. I make a number of changes, all are accepted. The report makes it into newspapers all over the world from the Telegraph to the front-page of Cuba’s La Granma and I like to think I had a part, albeit absolutely tiny, part in that. ← Developed and Developing: Time to start over?